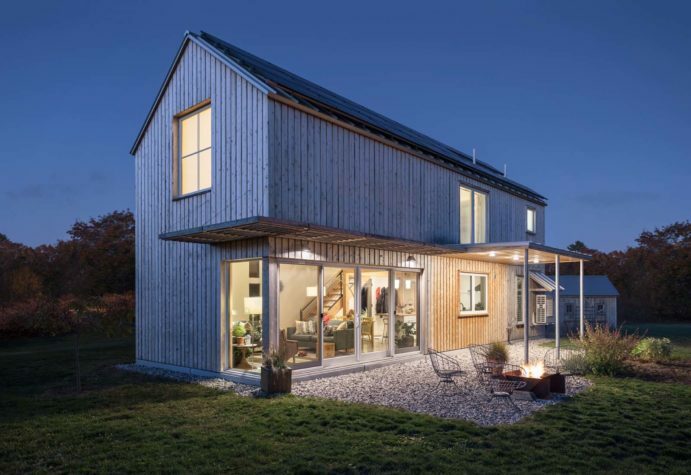 Nick and Molly LaVecchia’s York home by Caleb Johnson Architects and Builders is a marvel of small-scale design. 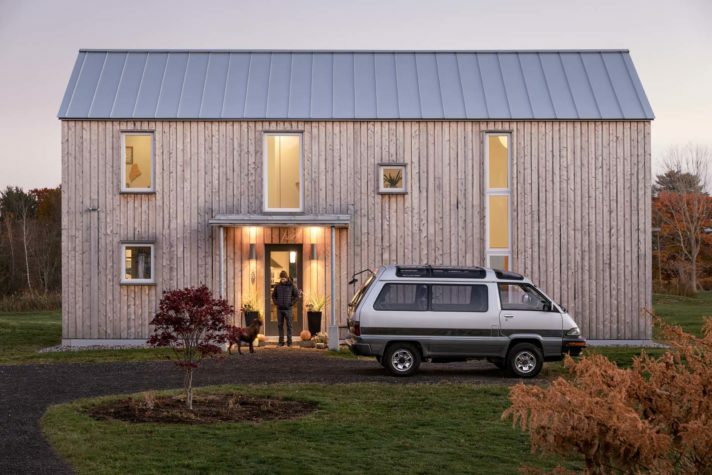 This eco-friendly, net-zero home breaks down the barriers between indoor and outdoor space. In their backyard, a Stahl Firepit provides a focal point for evening entertaining. In their cheerful kitchen, Nick and his son, Leo, enjoy some father-son time. “You can see and feel the attention to detail,” says Andy Herbine of Caleb Johnson Architects and Builders. “The house is well thought out so you never feel a draft over your shoulder, or like you’re too exposed.” The light xtures are from West Elm. Molly planted a Japanese maple before moving into the house. “She has a very clear vision of how the landscaping will come together,” Nick says. “She wanted to have a focal point for the front yard.” The red-leaved tree ts the bill. “We can watch the sunrise and the moonrise from our bed,” Nick says of the large windows in the owners’ bedroom. 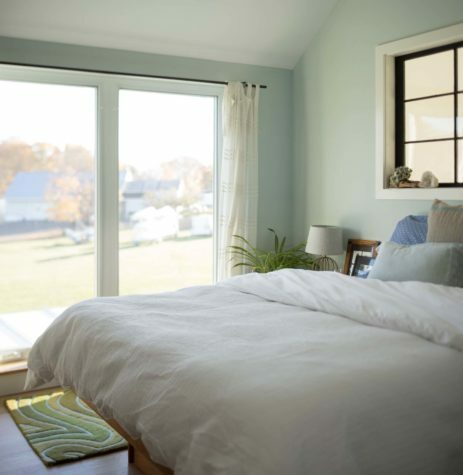 The interior window above the bed opens to the living room’s vaulted ceiling, which allows light to pour in from the room’s west-facing windows. Nick, a lifestyle photographer who specializes in sur ng scenes, works at his computer below a shelf of vintage cameras. 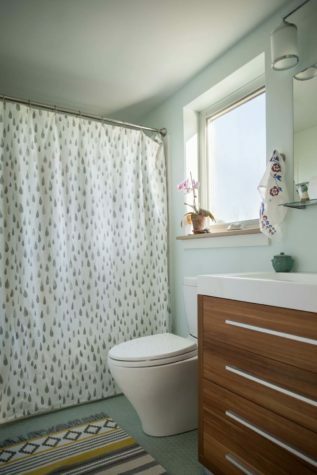 Despite the home’s small footprint, the upstairs bathroom is one of two. Nick and Molly made the shelves in Leo’s room from old bee boxes. A low- ow faucet in the downstairs bathroom. 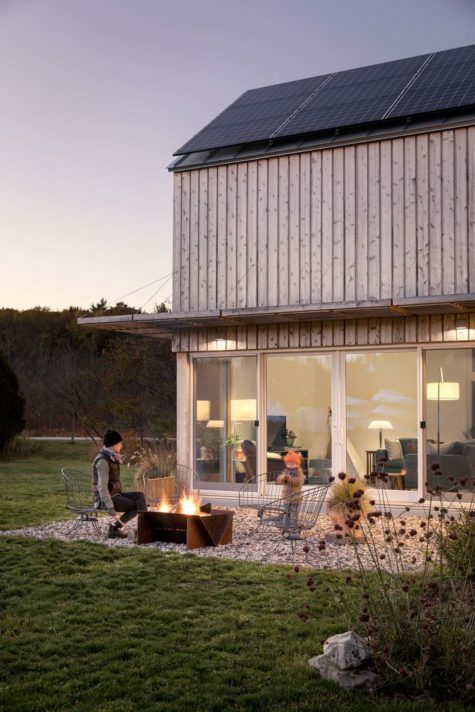 On the York Coast, an artistic couple builds an eco-friendly, solar-powered home ready for family memories. 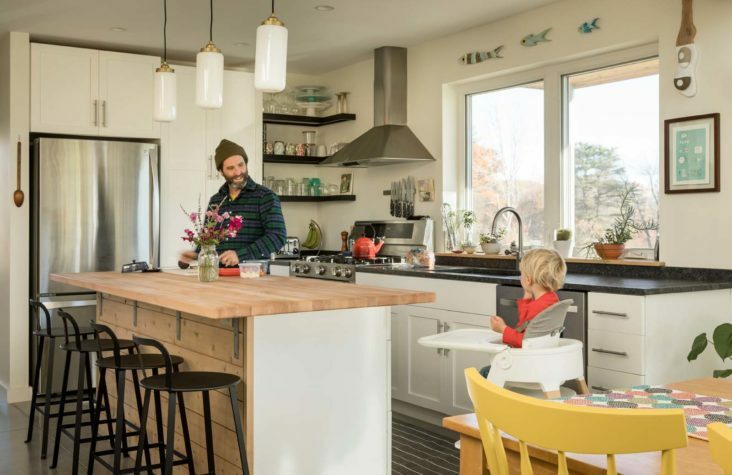 When Nick and Molly LaVecchia started planning their first home, they were faced with a constraint that limits many young families: a tight budget. 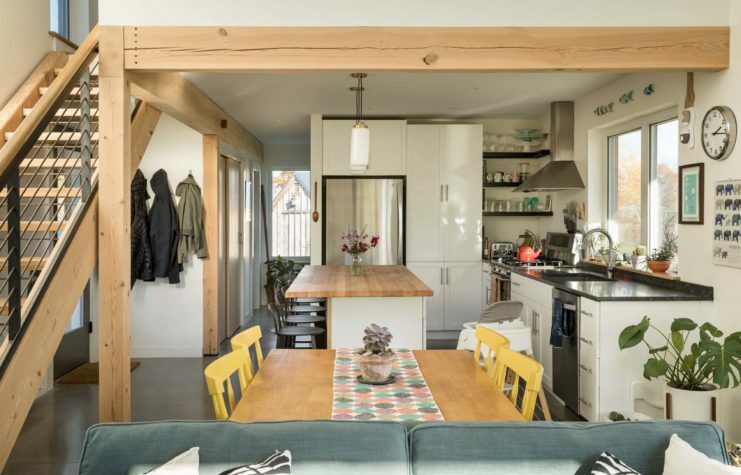 Nick, a lifestyle photographer who focuses on the ocean and surf culture, and Molly, a garden designer and landscaper, were looking for a space that would reflect their eco-friendly lifestyle while providing space for their young family to grow. Fortunately, they had several things that would serve them well: vision, creativity, and a nice plot of land, courtesy of Molly’s parents. Many of the elements that contribute aesthetically to the house also serve practical purposes. The polished concrete floor, which looks sleek and modern underfoot, functions as a heating source. “Concrete slabs used to be something people would cover up and hide,” says Johnson. 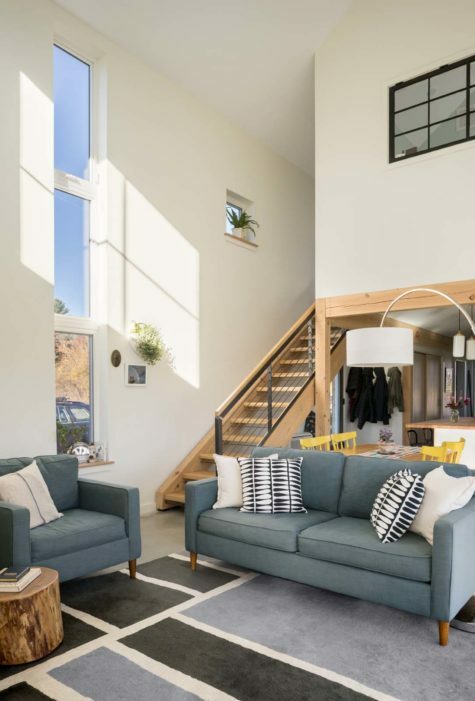 “But in the homes we build, it’s structure, finish, and a heating source, all rolled into one.” Sunlight streams in from the south-facing patio windows, hitting the concrete slab floor, and over the course of the day, the floor heats to an even temperature. At night it lets that retained heat slowly flow into the air. The house is tightly insulated with a combination of spray foam (installed on the roof), fiberglass batting, and recycled newsprint (installed in the walls), which ensures that little of this energy is lost through seepage. “If you can make the sun work for you, and it’s free, why wouldn’t you do it?” Nick says. While Nick and Molly love living in this smartly designed home, they still view it as a work in progress. The couple admit that they are still working out the interior design scheme, figuring out what photographs go where, what furniture will best fit their lifestyle, and where to fit their many books. 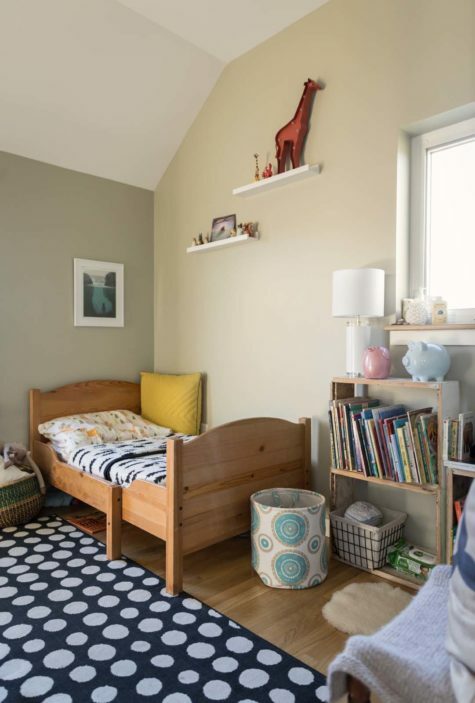 (They plan to construct a large bookshelf in the living room, which will take up the entire wall and require a rolling library-style ladder.) 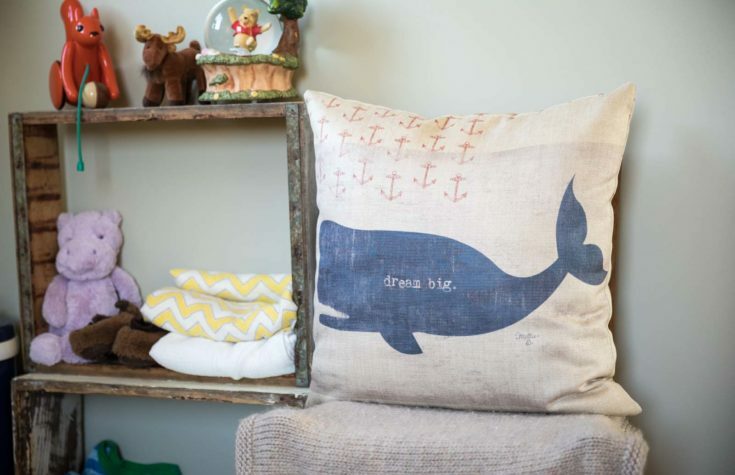 “The decor has evolved as we’ve lived in the space,” says Molly. “I have always loved the stark lines of the house, but I’m also trying to bring in some softness.” As a gardener, one of her first impulses was to bring in some houseplants. Evidence of her green thumb can be seen on nearly every surface, from windowsills to the kitchen counter, where potted ZZ plants, ivy, bamboo, and pencil cactuses enjoy the abundant natural light. “I started planting the vegetable garden before the house was done,” Molly says. Every year, for Leo’s birthday, she plants fruiting trees and shrubs as a gift to her son. So far, she has planted a hedge of blueberry bushes and a single cherry tree. But the garden, like the house, isn’t quite complete yet. “It’s been a slow process. I have to keep reminding myself that none of this will happen overnight,” Molly says. But homes, like gardens, grow best with patience and love, and those are two things this creative family has in abundance. Above Leo’s bed hangs a piece by Jeremy Miranda. 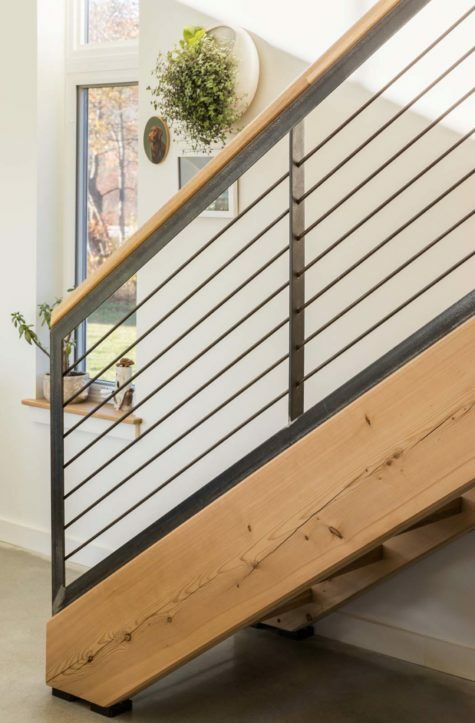 It was important to us that the stairs were as open and as architecturally pleasing as possible,” says Nick. The living room boasts vaulted ceilings. The couple plans to add more plants and art to the wall above the stairs.